The available Blue Accent Package helps you to take your Raptor to the next level of luxury. This package includes features such as the trendy RECARO front seats and carbon-fiber appliques on the shifter, instrument panel, and door. The optional Beadlock-Capable Wheels are both stylish and functional. 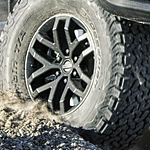 These tires give adventurers the option to reduce the tire air in order to deliver better traction when traversing rock or other rough terrains. Because the tires are clamped to the wheel directly, the tire is at less risk for popping off.